Eventually most applications develop some mechanism for launching and tracking the progress of a task running asynchronously. In the application this was handled in more then one way, by different parts of the application, but through the API we saw an opportunity to unite these different methods. Applications over time grow and morph in often unforeseen ways, heading in directions you never originally imagined (an incidentally this is part of the reason why our jobs as developers is so much fun). The result of this is that you can often end up with multiple features over time, that at first seem very different, but at some point a perception-shift occurs and you realize in fact they are variations on the same feature. It's going to involve lots of work to align everything together. Unless you plan to build further on this feature, it's difficult to justify any increase in value to the business. If you are somewhat pragmatic, you may struggle to justify it internally as well. But as an alternative to addressing the problem from the bottom up, when adding an API to your product, you also have the option of addressing it an API level - and having the API take care of then delegating to find the appropriate implementation. This is where the API then behaves as plaster, smoothing over the cracks and small imperfections in your implementation as it is exposed to the world of potential 3rd party developers. 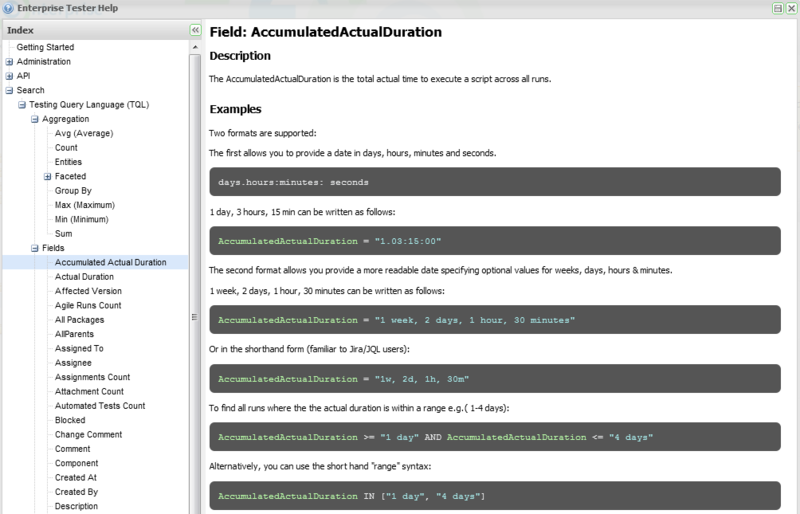 But enough of the hypothetical - let's take a look at what we did for background tasks. This allowed a thin adapter to be created over the top of each background task implementation. The key prefix also has the bonus of allowing our background tasks to be identified by something a little more meaningful then a GUID i.e. "reindex_task_B55C4A97-9731-4907-AF8F-13BB10A01C3A" - a small change, but a pleasant one. Last of all, each job implementation wraps the progress results from the underlying implementation , mapping them into the a common DTO. Like we do with other models returned from the API, we leverage dictionaries and JSON rewriting to handle adding additional information to the progress results. We can make additional GET requests to the Self URI to get progress updates, upon completion the response contains additional information (including in this case a link to a new resource that was created as part of the execution of this background task). Internally the underlying sources of the progress information didn't support progress change events - so we would still be having to poll internally. The SignalR + WebAPI story wasn't very well developed - we did review the SignalR.AspNetWebApi project on github, but it wasn't being updated at the same pace as the ASP.Net Web API preview releases were hitting github. We also investigated some other ideas - including PushStreamContent Which is now really easy to implement in the RTM build of WebAPI or trying to leverage WebBackgrounder (but that didn't really fit our needs). Next in part 7 we are going to take a look at the approach we took to testing our API (including end-to-end testing and Approval Tests). Authenticating users of an API is very important - and thankfully the many available extension points within ASP.Net MVC WebAPI make this really easy to implement. The application was already an OAuth provider (to support our OpenSocial gadget support) - so we also decided to adopt this for the API, thus allowing those gadgets to also interact with the API (and to allow for delegated authentication scenarios). If the request properties contains a user, we treat the request as pre-authenticated (used for testing mostly, more on that in a future post). If there is authorization header, we check the scheme and perform either Basic or OAuth handling of the request. Otherwise, we fall through to handling the request with session authentication. The HttpContext (and it's related abstractions) are fairly baked in to parts of the pre-existing Authentication infrastructure and so we need to extract this from the request to complete authentication in many cases - this has actually got much easier with each release of the WebAPI - the first WCF based drops of the WebAPI made this almost impossible to do without spelunking into reflection over private fields. With the WebAPI being asynchronous the mechanics of this didn't work very well for us (The thread the DelegatingHandler executes on for Authentication wasn't necessarily the same thread that constructed the controller and executed the action). It's not a beautiful solution, but had no impact on our existing implementation for authentication which is great. The one gotcha here is if returning a Task as the result of a controller action you need to be a little careful/take care with associating the user with the task's thread yourself. So far we only return a Task from the POST methods handling the upload of attachments as a mime multipart request, so this hasn't been too much of a problem to deal with. Next in part 6 we take a look at how we handled exposing long running tasks. Order the set of resources they get back. Filter the resources returned based on some criteria. TQL (Testing Query Language) is a Domain Specific Query language developed for searching and aggregating test information - and worth a series of posts all on it's own - but was definitely an existing investment we wanted to leverage when building out the products API. Or quite complex (the below query would find any requirements which are associated (indirectly) to bugs with a Resolution of 'Wont Fix' raised in the last week). AND CreatedAt >= "-1 week"
Quoting strings is optional for words not containing whitespace, and you can use single or double quotes. Encoding of strings follows the JSON conventions for escaping etc. When implementing the parser we ensured it was whitespace insensitive - so the above query can also just be written on a single line. This allowed us to make it easy to search via the API without having to URL encode the query parameter in many cases. Name ~ "te?t" AND Description ~ "'REST API' && 'Curl Example'"
This can trip up people experimenting with the API directly within a browser, where in some cases not escaping these characters correctly can result in part of their query being parsed as a parameter - so far this hasn't really proven to be much of an issue. The implementation defaults to including skip/top/total as well as next/prev/first/last links in the response - but we did provide a way for client consumer to excluded that information if they so desired (i.e. if implementing a search which is guaranteed to return 1 result) - by passing in the OData $inlinecount query parameter. We also exposed a search method, allowing you to execute TQL queries to search across all the entity types at once, implementation of the controller there was similar - one thing we did do is leverage the "Expansions" dictionary every view model has to embellish it with the type of the search result (as a property called "EntityType"). In the case of search results we are dealing directly with NHibernate entities, which can be proxies - thus the call to .GetUnproxiedType(). I always feel a little disingenuous referring to OData in our API docs - but unfortunately I don't know of a good term for what we are doing. Our support for OData extends as far as filtering a set of results (GET requests) and goes no further - we certainly did not build an OData compliant API, or ensure the shape of our results conformed to something an OData consumer may expect. The filtering specification outlined in OData though is incredibly useful to avoid inventing yet another query language unnecessarily (and was one of the draw cards for using WebAPI in the first place). This allowed us to just do filtering, and get the results back in our familiar QueryResults form (so we ensure consistency with the equivalent TQL query responses). AVG(EstimatedLessActualDuration) AS "Average Remaining Time (Per Script)"
"Average Remaining Time (Per Script)": "-00:03:00"
"Average Remaining Time (Per Script)": "-00:12:30"
"Average Remaining Time (Per Script)": "-00:28:20"
With the aggregated queries support in TQL, you can use functions such as COUNT, SUM(Field), AVG(Field) and so on... one of these functions Entities - which actually just returns an List of all the entities matching the criteria. This is not something SQL does, but this isn't SQL now is it - so there is nothing stopping us returning an array as opposed to a single value for any node in the tree of results. By default Entities will stop being collected by the query after there is 25, but the limit can be increased too if necessary. This feature is really useful when combined with a faceted search where expressions and formulas can be used to calculate which entities to include or not, and where you don't expect to get a large number of matching entities. So within the dictionary of results returned from the TQL query engine for the aggregated query, we may have a list of EntityInfo elements, one for each entity returned from a "Entities" aggregate function. So we ensure those aggregation results now have a URL pointing at the resource for that entity. Next in part 5 we take a look at how we handled Authentication, including support for Session, Basic and OAuth. The WebAPI supports generation of a help page featuring descriptions of each controller / Http method etc. - even generated samples - I found this blog useful to understand the process, including a nice video - and the feature has come a long way since it was first introduced. For a green-fields application I would strongly recommend using it! 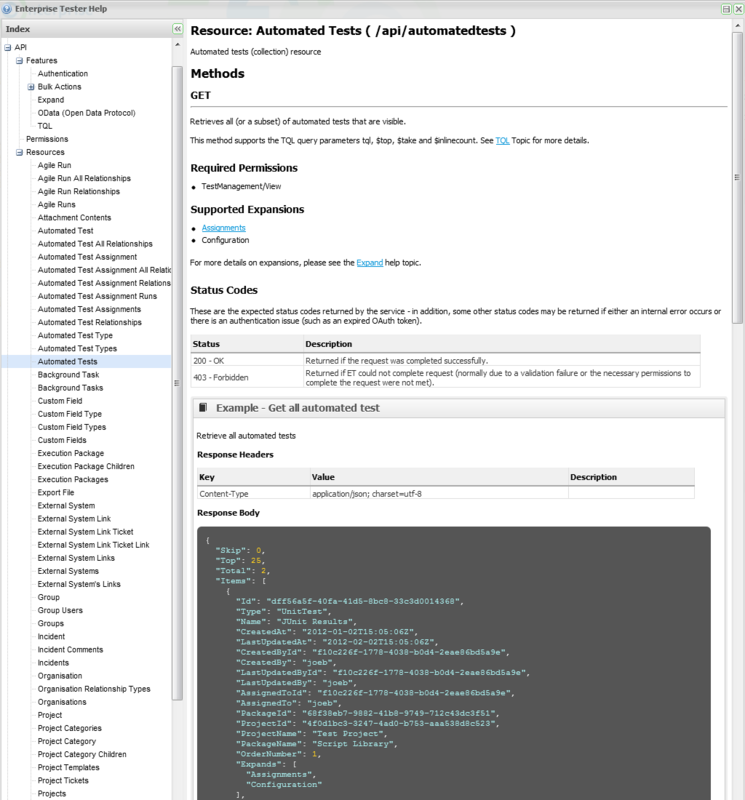 However, for Enterprise Tester we already had an existing in-application help system in place, and so decided to also put our generated API documentation there as well. We did initially look at harnessing what came out of the box with WebAPI, but decided given the way our JSON rewriting works, and some of our additional metadata such as expansions, that it would be easier to implement much of what we needed from scratch. To do this we opted for a more localized approach - marking controllers and action methods up with attributes to provide the metadata to generate the documentation - this also provides a hint about the Expands it supports etc. And then controllers (or their abstract base controllers...) could provide examples by implementation a static method on the controller itself i.e. Also notice that in the example info we have both a ResponseModel and a RenderedResponse properties (and equivalents for the request) - rendered requests (strings) are useful when providing examples for documenting multi-part mime supporting methods, but primarily we leveraged the RequestModel/ResponseModel which meant changes to examples would always reflect the current codebase. In addition we generate a index list of all available resources, providing a quick overview of what methods are support by each resource. For collection resources, where the results can be filtered (either by filtering via OData's $filter query parameter, or via TQL - Testing Query Language) we also include a small label indicating which query type is supported. Last of all (an arguably one of the most useful views for a developer building an API) is the permission view - though you should obviously have tests to verify the authorization restrictions applied to each method, it can be very useful to see it presented in a matrix view - so for each resource, we can see what permissions are required. Because of the underlying help system it's possible for 3rd party developers to further extend the content of these help topics or add new topics to further document the capabilities of the API. 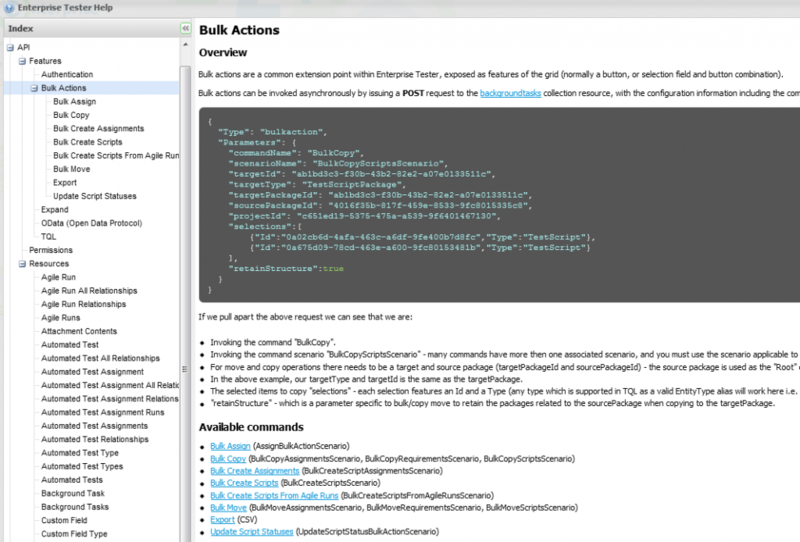 Last of all beyond REST we also expose some existing functionality via JSON RPC, such as support for bulk actions. Bulk actions within the application take a set of items (or a query returning a set of items) and then applies an action to that set - be it generating some form of Export, performing a bulk move/update/delete etc. We contemplated trying to translate these concepts into a RESTful context, but it didn't really make sense and so instead opted for a mechanism to start these background tasks, and then monitor their progress. Metadata related to bulk actions was already available via the IoC container, so we implemented some additional help topic "providers" to generate additional topics necessary for examples of the various types of action you could execute through the API. Next in part 4 we take a look at OData, TQL and filtering of collection resources. Round-trips are the death of performance in many cases, and this is no different for API's. The web does scale out well - so there is certainly the option to make lots of simultaneous requests, but this does not take care of the problem of addressing those related resources - if the you need to fetch back a resource's representation before you can construct additional requests to fetch other resources, you still are faced with the issues of latency. OData provides a mechanism for implementing this via a URL containing the $expand query parameter. API's implemented for products such as Atlassians Jira (popular defect tracker) include an "expand" parameter which achieves the same thing, but uses a slightly different approach. The API being presented here is not an OData compliant service - but certainly the Expand concept was a useful one we wanted to adopt. Would return a script package (folder) with all it's child packages, those child packages children and those child packages scripts (test cases). Notice that we advertise the available expansions as a property of the resource - this is a feature of the Atlassian Jira API we adopted (and this list changes based on what expansions have already been applied). Constructors - which are able to take a DTO/domain class/Tuple/whatever and construct a view model from it. 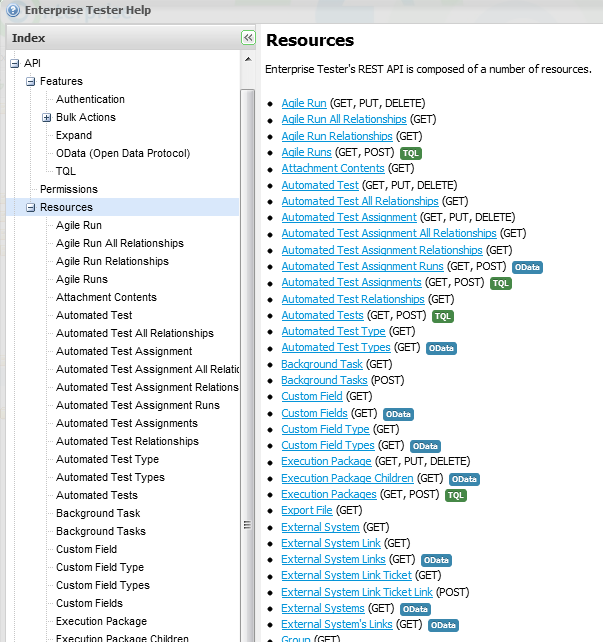 Given the plugin architecture used within the application, this provided the ability for plugins to add new Expand options to existing resources - so for example if a customer has the automated testing plugin enabled, then the script packages (folder) will also support expansions for the "AutomatedTests" collection of automated tests within that package. As an example how we register an expander - here is code to register the expansion for a collection of steps associated with a script. In this case we are using Expand to avoid the cost of expanding a large collection (the steps for a testscript/test case) which is part of the Script aggregate (believe it or not, there are testers out there writing tests scripts with 300+ steps...). The Expands property in this case just exposed a property associated with the current request. And this request property was captured by a simple DelegatingHandler that would parse the query string for various OData parameters - this approach made it a bit easier for other delegating handlers to have access to this information prior to the controller's methods being invoked. For those who have been working with the various releases of ASP.Net WEB API since it was originally targeting WCF, there have been quite a few breaking changes along the way, including OData - which was introduced initially as a basic [Queryable] attribute that could be added to controller methods, and then later on, removed entirely pending a new OData re-implementation. Recently the Web API team have announced greatly improved support for OData in the WebAPI - allowing the construction of entirely OData compliant services, as a preview release on nuget - the [Queryable] attribute is also back. I believe this now includes support for $expand, which was previously missing, but I haven't yet had a chance to play with the latest release to confirm this - but I'm not entirely sure if this would have worked for our approach at any rate. Next, in part 3 of this series we take a look at how we generated API documentation.